According to the website Good News Pilipinas, two major awards from an international science fair held recently in Thailand were brought home by students from Philippine Science High School (PSHS). Marnoel Cruz, Joseph Adrian De La Cruz, and Justine Ryan Silvestre of PSHS-Central Luzon Campus won awards for Best Overseas Project and Best in Oral Presentation for their research entitled “Oxygen Plasma Surface Modification of Polylactic Acid-Cellulose Acetate-Chitosan Nanocomposite Fiber: Its Effect on Hydrophilicity and Anti-Bacterial Property Against E. coli and S. Aureus.” I have no idea what the words meant nor the research in general, but I’m happy that these students achieved something in an international level. Anyway, the PSHS research which was able to discover plastic materials that are biodegradable but at the same time resistant to heat bested 127 other research entries from other countries. Fifteen renowned schools from 11 countries around the globe participated in the fair. PSHS-CLC Director Lilia Habacon and the team’s teacher-adviser Rowit Tilwani accompanied the students. The awarding ceremony was held in January at the Mahidol Wittayanusorn School or MWITS Science Fair in Nakhon Pathom Province. 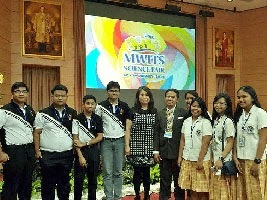 The MWITS Science Fair was established in 2005 as an annual assembly for students in Thailand and international schools to showcase their scientific research ability and engage in peer to peer interaction. The fair helps develop young talents to be great scientists and heal the world. PSHS is a secondary school operating under the government’s Department of Science and Technology that offers science and engineering scholarships to high school students.